At the heart of employee engagement is impactful communication. The two-way flow of messages is vital for building knowledge and understanding, for creating a sense of team and of belonging, for generating feedback which supports continuous improvement and, importantly, for building trust. And there are some key principles that can help to ensure your communication with employees is effective, impactful, and ultimately, engaging. Make it regular. Gaps and silence create mistrust and suspicion so keep communicating regularly. Even if there is nothing significant to say, keep talking. This is so important – because when leaders do not update and inform, employees will create their own narrative from nuance and rumour – and such narrative can have a significant and negative impact on engagement and satisfaction. Don’t assume. Just because an issue has been referred to in a meeting or mentioned in minutes, do not assume that knowledge of this has been shared across the organisation. If you want your employees to know something, proactively tell them – and as early as you can. Make it appropriate. One size doesn’t fit all when it comes to communicating with employees so use the methods which are right for your audience – and to know what these should be, ask your people. This may mean employing a range of channels to meet differing needs, or shaping your preferred channel – online for example – to meet everyone’s needs. It is vital too to engage your managers to help share your message, but make sure that they feel able to do so by having clear facts and information available to them. If your managers are unsure of the information they are sharing, this will be evident and will diminish the power of the message. Make it accessible. We all have different levels of knowledge and ability of language but one way in which you can reach more people is through Plain English. Through the use of clear language, such as offered through the Plain English approach, your communications will be more accessible and will reach more people. It will also make people feel equal and not disadvantaged or excluded by their knowledge of English. Similarly, avoid using jargon as this can create great barriers in communication – just because people are working for the same company does not mean that they understand the industry acronyms. Inaccessible language wastes time as people try to decipher meaning, and it can be divisive. Think about the visual messages. Alongside your words, what visuals are you using? What unconscious messages are you conveying? What barriers are you creating? For example, a talent management programme leaflet using only the images of young people may alienate older employees looking to develop. Make it personal. The message you are sharing should be ‘owned’ by a person, preferably a leader, as people always respond more positively when engaging with a company rather than an organisation. This personalisation can be demonstrated through use of first names when writing to employees, handwritten signatures and always using ‘I’. Invite feedback. Communication should be two-way in an organisation. When you communicate, ask for feedback, and feedback to employees based on that feedback. This visible sharing of views will demonstrate that an organisation is open and honest. 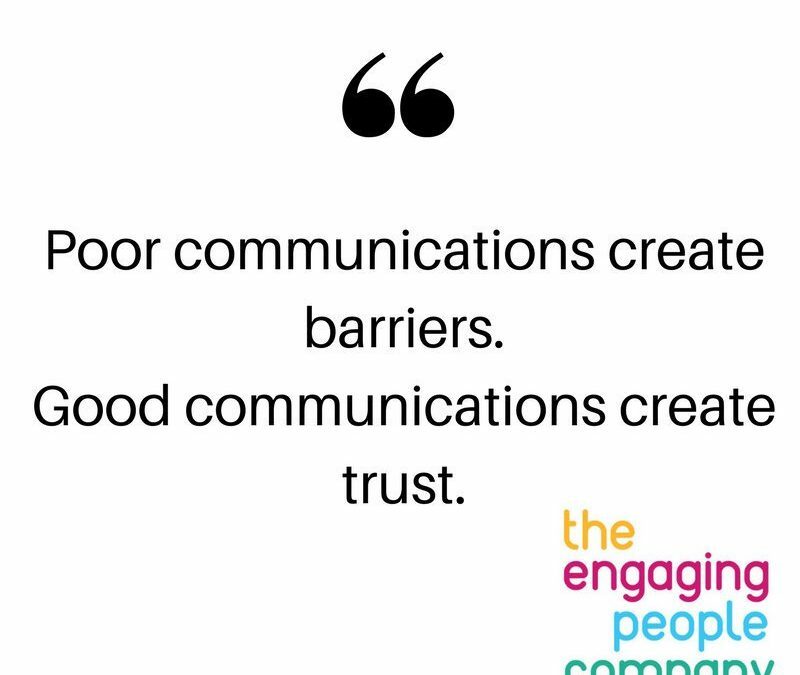 After all, poor communications create barriers whereas good communications create trust – which ultimately leads to engaged, satisfied employees.